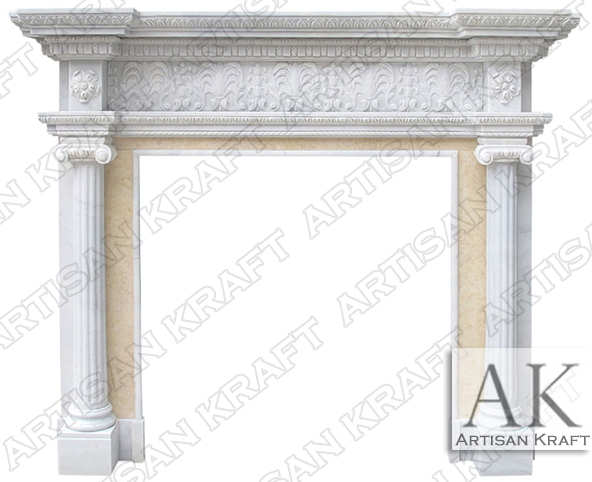 With two fluted Ionic columns flanking the sides of the Ionic Albany NY fireplace giving it a regal feel. Fireplace pictured in White Marble and Galala Marble. Beautiful coordination of ornate details and two tone marble fireplace design. Available for delivery in 1-3 weeks. This surround facing comes with a hearth and additional inner surround pieces that wrap the fire-box opening. Make this the center piece of your dream house.